On the question of voter turnout, 67.2% of respondents said that they planned to vote in the election, set for Jan. 22. The poll found a higher level of motivation to vote among leftist voters than rightist ones, with centrist voters showing the highest level of indifference. A more detailed poll conducted by Midgam for Channel 1's weekend broadcast found Likud Beitenu with 36 projected seats, Labor with 20 seats, Shas - 11, Jewish Home - 10, Tzipi Livni's newly formed party would get only 9 seats and Lapid's Yesh Atid 8 seats. Overall the right-wing/religious bloc is projected to get a majority of 66 Knesset seats. When respondents were asked if they are certain to vote for their current choice, among the religious parties voters, 100 percent were certain of their vote and would not change their mind, while among Jewish Home voters only 71 percent were certain about their vote, compared to 29 percent who might change their vote. Citing its own poll, Ynet admits Likud is gaining strength, yet insists that Israelis strongly believe Livni is the 'strongest premiership candidate against Netanyahu', despite the fact that on one-on-one she trails Netanyahu by 25 points. The poll published by Yedioth Ahronoth on Friday, shows that Likud is gaining strength after its primary elections indicated that it was shifting to the right. According to the Mina Tzemach/Dahaf poll, Likud Beitenu would win 37 Knesset seats if elections were held today, Labor, on the other hand, lost five Knesset seats and is set to win 19 in the upcoming elections, and Tzipi Livni's Hat'nua are expected to get nine Knesset seats each in the January elections. "The radical leftist list of the Labor Party reflects Chairwoman [Shelly] Yachimovich who voted for [the leftist] Hadash [party]. This is an extreme leftist list which enthusiastically supported the disengagement, that brought Hamas up [to power] in Gaza and could now bring Gaza into Jerusalem and the outskirts of Petah Tikva "
The big winner in the Labor party's primaries was non other than one of Yechimovich's "target list" candidates, leftist television personality and Haaretz commentator, Merav Michaeli, who claimed the the first spot as the woman candidate, despite the fact that she did not have the support of party leader Shelly Yechimovich. Earlier this month, Yechimovich screened Michaeli's calls and ignored her SMS messages notifying her about joining the party, since according to Yechimovich Michaeli would have a bad effect of the center-left image shes is trying to paint Labor party. "The most bitter pill Yacimovich has to swallow is the incredible success of Haaretz columnist Merav Michaeli," wrote Anshel Pfeffer in Haaretz. "Michaeli was another of the candidates that Yacimovich saw as "too left-wing" for her list." Only about one-third of Israelis think Israel has benefited from the recent operation Pillar of Defense in Gaza, according to an extensive survey conducted by Dahaf Institute for Saban Center for Policy. 40 percent of respondents said that they felt Israel “won the combat in the Gaza Strip.” 45 percent said neither Israel nor Hamas carried the more than week-long conflict, and 11 percent said Hamas came off victorious. 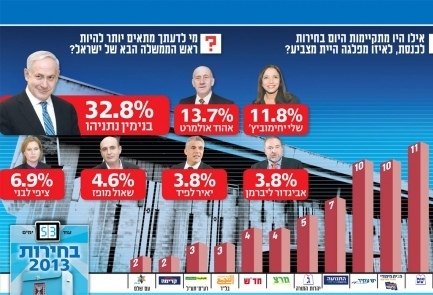 Interior Minister Eli Yishaihas become more popular than Aryeh Deri since unity was restored in Shas, according to some interesting poll data obtained by 'Kikar Shabbat' from Prof. Rafi Smith's crosstabs, who conducted the poll for Globes and the Jerusalem Post. Survey respondents were asked: "If the elections were held today, were Shas headed by Eli Yishai, and all other parties unchanged, which party would you vote for ?" 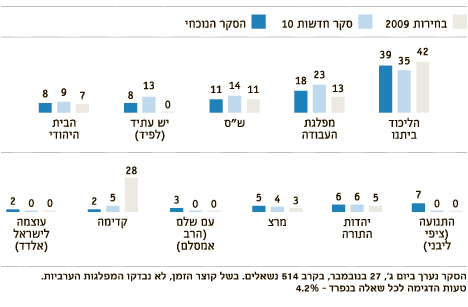 The Yediot Achronot/Dahaf institute poll published this morning, as the Ma'agar Mohot poll broadcast Thursday night on Channel 2's 'Mishal Cham' program, both suggest that Tzipi Livni's new party would receive 9 projected seat, if elections were held today. 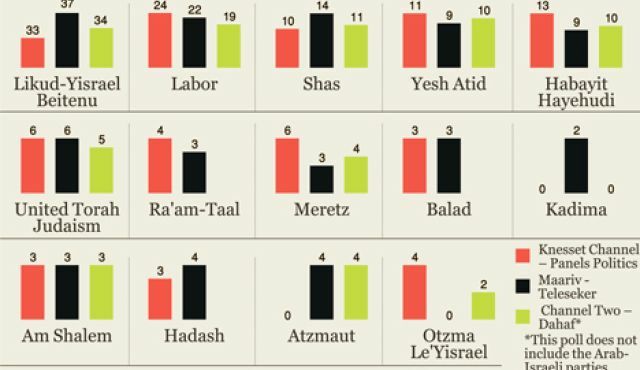 While Ma'agar Mohot's poll grants Likud Beitenu 38 seats, Labor 18, Shas 14 and Yesh Atid 5 , Dahaf poll projects 37 seat for Likud Beitenu, Labor 19 and Yest Atid 9. In a hypothetical one-on-one race for Prime Minister, Benjamin Netanyahu is viewed most suitable to be Israel's next Prime minister by a whooping 62 percent, compared to Shelly Yechimovich who's viewed most suitable by only 19 percent. However in a one-on-one race between Netanyahu and Livni, Netanyahu scores 55 percent compared to 30 percent for Livni. A New Wave Poll conducted for Israel Hayom weekend newspaper shows Likud Beitenu with 39 projected seats, Labor with 20, Shas - 11, Jewish Home and Yesh Atid with 10 seats respectfully, and Tzipi Livni - The Presumed alternative to Netanyahu from the center-left with 7 projected seats. Netanyahu also pertains his frontrunner race as most suitable candidate for Prime Minister, even in the event of a hypothetical 6-man race between Netanyahu and the 5 - Yechimovich, Livni, Lapid, Mofaz and Olmert - who see themselves as extremely fitted to steal the crown from King Bibi. According to a Panels Politics Institute commissioned by The Knesset Channel and published today, the Likud Beitenu party would get 39 projected Knesset seats, and Labor 18. Jewish Home and National Union – 10. Shas – 10. Yesh Atid – 9. Tzipi Livni’s The Movement – 6. UTJ – 5. Meretz- 5. Am Shalem, Hadash, Raam-Taal – 4. MK Dr Michael Ben Ari and MK Eldad's Power to Israel and Balad – 3.Which grants the right-wing/religious bloc a solid 71 majority out of the 120 Knesset seats. In whats seen as a traditional indication of the mood in the country, and an effort to get the High school students who are regarded as first time potential voters, to participate in the conversation and become involved in political activities, "Democracy Day" kicked off their first day of activities, which will be held in 21 High schools across the country in the coming weeks. Today, students and young voters at Mosinson High school in Hod HaSharon picked Netanyahu's leading party - Likud Beitenu as their preferred choice with Lapid's Yesh Atid as 2nd choice. Livni has reached the ceiling in terms of seats she would get if she continues to run independently, according to a new poll conducted by the Rafi Smith research institute for "Globes" and "The Jerusalem Post". The Globes poll shows Netanyahu in a relatively comfortable position with 37 projected seats, while Livni, who claims to be the only alternative to Netanyahu would receive just 6 seats. With such a cold reception and a rocky start, Olmert working hard against her by helping Kadima, and the knives that are sharpening within the left-center bloc, Livni doesn't have much ground to fall or pick up, which could force her to reconsider the idea of joining up with Shelly Yachimovich or Yair Lapid, or lose steam. The New Face of the Likud? “As long as he has not chosen one of his options, all options continue to be on the table in one way or another,” an Olmert associate said. Something is Missing in Shas, Where is the Magic Deri? Since his return to Shas a few weeks ago, Arieh Deri's magical power of energy seemed to evaporate. In most of the public polls over the last couple of weeks, Shas doesn't move an iota beyond the same 11 seats it holds in this Knesset. Has the Deri magic lost its power? Anshel Pfeffer in Haaretz dares to ask. Labor will hold tomorrow (Thursday) the primaries to select the candidates who will be running on the Labor slot for the 19th Knesset election. “Unless we have something very dramatic, it really looks as if it’s going Netanyahu’s way. It’s not guaranteed. I cannot say it’s a 100-percent bet but a 70 percent bet. More even,” he said. Tzipi Livni gets no love this time around, as Shlomo Avineri, an Israeli political scientist, writes in Haaretz: Tzipi Livni is a serial failure, based on her own record. "Tzipi Livni.. doesn't have political leadership ability and this absence has accompanied her in her public life thus far," he writes. "It is a pity that after months of activity hidden from the public eye - as though it were a matter of planning a secret military operation - she did not manage to overcome her passions and admit her limitations." Prime Minister Benjamin Netanyahu was said to be pleased with the Likud's new list, Mati Tuchfeld writes in Yisrael Hayom. Netanyahu's close advisers said on Tuesday that the Likud's new list reflects the public's desire and may prevent people from voting for more right-wing parties such as the New National Religious Party, chaired by newly elected Naftali Bennett. The advisers said there is no concern over voters leaving the party for left-wing parties such as Yair Lapid's Yesh Atid ("There is a Future"), Labor, or Hatnuah ("The Movement"), which was announced by former Kadima Chairwoman Tzipi Livni this week. Party members said on Tuesday that the new list was varied more than they expected it to be and included more Sephardic and young candidates than they believed it would. "Every time the Likud holds primaries the headlines say the next day that the party has moved to the Right. It has become a ritual that no one is concerned about," a Likud minister said. "It will only be a matter of time until Kadima is split, and when it does it will be into many pieces. It could be days or months away, but the death of Kadima is near." Gil Hoffman writes in the Jerusalem post this morning how Tzipi Livni's strategist recalled the original English name of her new party 'Hatnua - The movement, over Twitter and Facebook jibe, to "The Tzipi Livni Party, and ultimately forced the Jerusalem Post, one of Israel's leading English read news sites, to act accordance. INN -- The head of the IDF’s Southern Command said on Tuesday that he was “surprised” at how quickly the rocket fire from Gaza stopped when a ceasefire came into effect last week. Maj. Gen. Tal Russo said he believes the quiet in Gaza is first and foremost because of the severe blow dealt to Hamas during Operation Pillar of Defense. “Right now, the change is extreme," said Russo. “The deterrence is very strong and even with the cries of joy in Gaza, we understand and they also understand that Hamas was hit very hard." A week after the cease-fire in the south, which angered many Likud voters, and 24 hours after the Likud primaries for the next Knesset, Likud Beiteinu's lead is growing and moving closer to 40 seats, according to the latest Haaretz/Dialog poll. Tzipi Livni who announced today the formation of her new party called "The Movement" would get only 7 seats, if elections were held today. Overall, the Likud-led right-wing bloc would receive 69 seats, compared to only 51 seats to the center-left, including the 11 Arab seats. How Extremely Right-Wing is the Likud List? "If you take a deep look deep at the Likud list and analyze the results, it's evident that except some minor changes in some of the places, there's no extreme change in the Likud's political and diplomatic position, as claimed in the press. Last night, Chemi Shalev argued that the results of the Likud primary, which turned the party further to the right, "presents an opportunity for Livni because it might open up space for centrist parties to coalesce to challenge Benjamin Netanyahu." Turns out his smart take was met by any icy response from voters, the media and in particular the left. Brent E. Sasley writes in the Daily Beast that Livni's move by hook and by crook only helps Netanyahu win reelection and even sighfen votes from the center-right, since Livni fractured the center-left bloc, leaving voters to decide between the inexperienced and the irrelevant. It wasn't political or ideological, it was all about Iran, Reuters claims about last night's Likud primaries vote. Netanyahu free of Barak, Meridor and Begin will rush to strike Iran tomorrow morning, according to Reuters. "Dan Meridor and Benny Begin, two of eight cabinet ministers who form Netanyahu's inner council, were trounced in an internal election by more hawkish members of the ruling Likud party on Monday, raising doubts over their return to the next government. A new poll conducted on the eve of the Likud's primary elections and released on the Channel 10 morning program by Ma'agar Mochot, found only nine percent of the Israeli voting public would reconsider their vote due to a Likud shift to the right, Sixty-nine percent of respondents to the poll said they would not change their vote, while 22% said they didn’t know. (Ari Shavit, Haaretz Feb, 04, 2009) Over the past week I took statements from about a dozen people who know Tzipi Livni quite well. . The portrait they paint of Livni is a disturbing one... Livni is short-tempered. Her more serious critics believe she has an attention deficit. She is incapable of delving into the details of a document or of sustaining an extended discussion. She does not stay with a topic until it has been completely clarified. Her thinking is not clear and she cannot distinguish the wheat from the chaff. Livni tends to oversimplify, to go for the schematic. The 'Far Right' Likud list back then in 2008 did not include Moshe Feiglin, yet did include Benny Begin, Michael Eitan and Dan Meridor. go figure! Netanyahu Presents Likud List to Merge with Yisrael Beitenu: "This Time We're Going Big." "We have a national team, a strong and young team, a veteran and talented team that came from all parts of the nation and represents all sections of the people," Netanyahu said, adding, "Today it has been proven once again that the Likud is the party of the people." 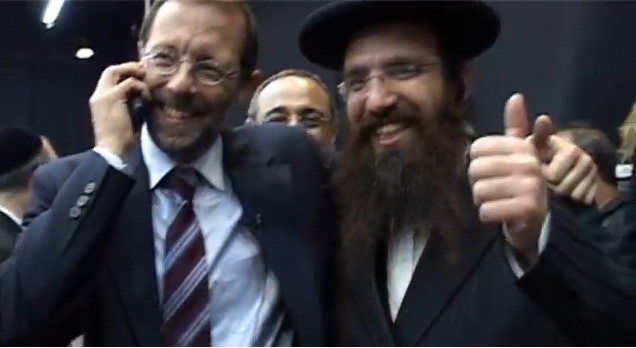 Netanayhu: "Today It Was Proven Once Again That the Likud is the Party of the Nation." 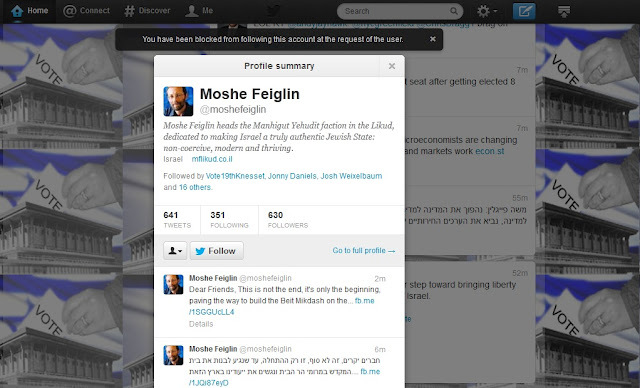 Why Did Moshe Feiglin Block the Bibi Report (@BibiFeed) on Twitter? Likud Primaries: MSM Unite with Same Headline: "Likud Takes Right Turn." Israel - “The Likud shifted rightward” were the headlines in all of the major Israeli news sites , as over 70,000 Likud members selected their choice of candidates for the 19th Knesset Likud list, on Monday. Falling in the latest round of polls, Yesh Atid (Future) party chair, Yair Lapid, announced on his Facebook page Sunday that he has asked Tzipi Livni to be in the number two spot in his party's Knesset list. Livni is expected to announce this week that she is running in an independent party. "In the past few days I have had quite a few conversations with Tzipi Livni," Lapid wrote. "She received an offer to be Number Two on the Yesh Atid list and to be a full partner in all of the important decisions. Splitting the centrist bloc is not good for Israel and I am calling on her to come, join hands and strength, and change the country together." For Tzipi Livni, in a field full of talented but inexperienced candidates, it is still about 'Bibi or Tzipi'. Hence, it ain't going her way too smoothly. Harretz's Yossi Verter describes best Livni's new style of politics - My way or the Highway. "Two weeks ago Livni declared she wouldn't do this, saying the continual splits, divisions, and fragmentations of the center-left don't serve the ultimate goal: bringing down Netanyahu. So she said it. So what? Following Labor Head Shelly Yachimovich's offer on Saturday to former chairman of Kadima, Tzipi Livni to join Labor Party and accept the second place, Yair Lapid, who just recently expressed no opinion in joining forces with Livni, put out a similar proposal. Hence, according to Omri Maniv from Ma'ariv, Livni set her conditions to join Lapid only if she would be Yesh Atid's candidate for prime minister, which of course Yair Lapid rejected. In Haaretz' summary of polls, as well as Knesset Jeremy's Weekly Average (week of Nov 18-24) of 7 polls (3 Channel 2 polls, Ma’ariv, Ha’aretz, Knesset Channel and ICPT), Likud Beitenu seems to be losing steam following operation Pillar of Defense, getting at this point less seats than both parties currently have in the Knesset, but no endangering Netanyahu's reelection and his quest of forming a stable government for the next four years. Following the mess and dysfunction at the Likud primaries today, Yesh Atid leader, Yair Lapid wrote a FB statues - his usual interactive tool with voters and the press - "I looked at the Likud primaries, and they want to run a country?," Lapid wrote. Jacob Kornbluh talks to Jeremy Saltan from Israel - on the Likud primaries, the 19th Knesset elections, Bibi's future and social media. Worth a listen! Sometimes the message is about the name. In this case, for one of the highly favorites among the Women candidates who are seeking to be placed in a realistic place on the Likud list for the 19th Knesset, taking place in Tel Aviv today. "Bibi needs Barak in Likud," the video opens. "But [Ehud Barak] is not one of ours, and this Barack [Barack Obama] will not make Aliyah. We need our own Barak." Netanyahu (14/03/2012): [Olmert, Livni] Brought Iran into Gaza -- We Will Remove Iran from Gaza. In the spirit of the season, and amid the expected return of Olmert and Livni to politics, as a joint team or Livni alone, here is a video of PM Netanyahu in a speech to the Knesset on march 14th, 2012 reminding Kadima leaders who brought upon the situation in Gaza. Make also note of the last line: "Sooner or later, Iran's terror base in Gaza will be uprooted." Former Kadima chairwoman, Tzipi Livni is expected to meet on Sunday with former Prime Minister Ehud Olmert and discuss with the possibility of running together as a team in the upcoming Knesset elections, Channel 2 News reported on Saturday evening. Two weeks prior her expected announcement of returning to politics, running for the 19th Knesset as head of a newly formed party, Former head of Kadima, Tzipi Livni told an audience that her intentions are functioned by merging a few parties together rather than splitting the Left-wing camp she belongs to. Haaretz's Editorial may not come across too well among Likud voters, but for the general public drawing conclusions, this editorial brings out Netanyahu's responsible path to secure Israel and restore the deterrence, by also drawing a sharp contrast between Netanyahu's and Olmert's conduct handling the war on Terror in Gaza. Despite the displeasure among the Israeli Public in general and the right wing voters in particular about ending the Gaza Offensive too soon, a new poll conducted by Ma'agar Mohot institute for Israeli newspaper Ma'ariv found the newly-merged party of Netanyahu and Foreign Minister Avigdor Lieberman, 'Likud Beiten'u, would take 37 of the 120 Knesset seats up for grabs on January 22. "I know there are citizens expecting a more intensive military operation, and it is very likely that one will be required, but right now, the right thing for the State of Israel is to take advantage of the opportunity for a protracted cease-fire," PM Netanyahu told the Israeli public following the ceasefire announcement.